German citizens are amongst the oldest in the world. Due to insufficient knowledge about the neuronal mechanisms underlying age-related cognitive and sensorimotor decline, an increasing number of people in Germany suffer from age-related loss of autonomous living. In the current project, we propose a fresh approach to this topic. We will target central neuronal mechanisms that have in recent years been connected to age-related cognitive and sensorimotor decline. 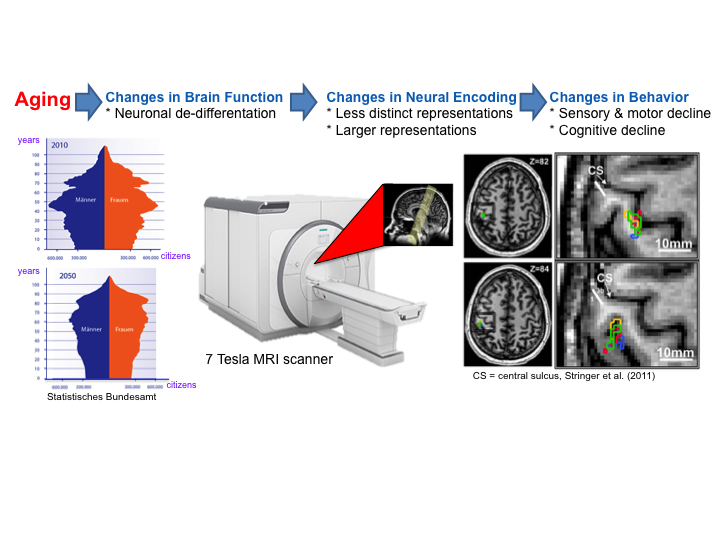 We will use cutting-edge methodology, including structural and functional imaging at 7 Tesla MRI, to explore architectural changes in primary sensory brain areas that have in animal research been related to neuronal de-differentiation. Besides gaining experimental knowledge of striking importance, the proposed project will also aim to implement novel scanning protocols and analysis pipelines at the DZNE Magdeburg. 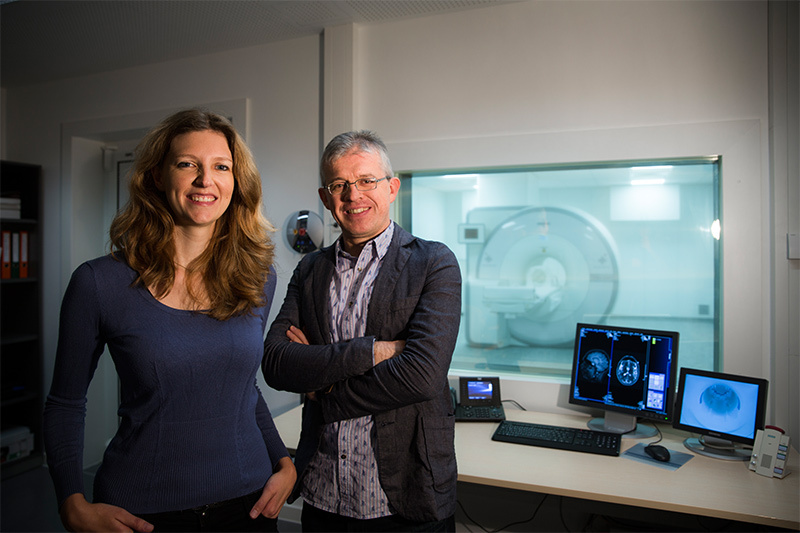 This will be performed in close cooperation with established research partners at the Max Planck Institute for Human Cognitive and Brain Sciences in Leipzig, and UCL in London. Kuehn E, Pleger B (2018) How visual body perception influences somatosensory plasticity. Neural Plast 2018:7909684. Kuehn E, Chen X, Geise P, Oltmer J, Wolbers T (2018) Social targets improve body-based and environment-based strategies during spatial navigation. Exp Brain Res 236:755-764. Kuehn E, Haggard P, Villringer A, Pleger B, Sereno M (2018) Visually driven maps in area 3b. J Neurosci 38:1295-1310. Kuehn E, Perez-Lopez MB, Diersch N, Döhler J, Wolbers T, Riemer M (2017) Embodiment in the aging mind. Neurosci Biobehav Rev 86:207-225. Kuehn E, Doehler J, Pleger B (2017) The influence of vision on tactile Hebbian learning. Sci Rep 7 (1): 9069.
somatosensory and motor cortex. Cereb Cort 10: 1-16.
connectivity profile. Brain Struct Funct 221(3): 1555-1571.